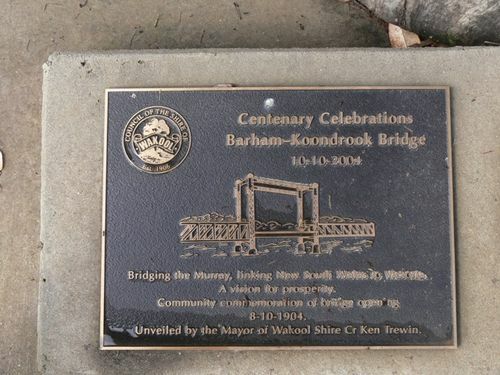 A plaque commemorates the centenary of the opening of the Barham - Koondrook Bridge in 1904. Barham's development was aided when a lift span bridge across the river opened in 1904 designed by Sir John Monash. The bridge replaced a punt that was used to ferry people, stock and goods across the river, and allowed road access between the Riverina and the Victorian markets, while permitting the passage of paddle steamers when the middle section was raised. Until it was motorised in 1997 it was operated by a system of weights worked by two men turning wheels. It is still occasionally raised. The bridge is now one of the oldest remaining across the Murray River. Kerang, 30th September. The bridge across the Murray at Koondrook connecting that township with Barham on the opposite side of the river, of which a detailed description appeared in a recent issue of the "'Bendigo Advertiser," will be officially opened by the Ministers of Works for Victoria and New South Wales, in conjunction, on Saturday next, 8th inst. This important function will undoubtedly attract a large and representative gathering. Bendigo Advertiser (Vic), 1 October 1904. Bridging the Murray, linking New South Wales to Victoria. Unveiled by the Mayor of Wakool Shire Cr Ken Trewin.